This topic contains 4 replies, has 4 voices, and was last updated by Dave McGovern 4 weeks, 1 day ago. Rich, Jim and I got back to Chicago Sunday a bit after dinner time. I want to thank everyone we met over the weekend for the great time and superb hospitality. We were very impressed with the level of organization the race committee demonstrated. We picked many brains for ideas and insight that we can use to improve our Illinois Whitewater Fest race in July. It had been several years since my last trip to the Saint, and it was a great run even with the low water level. I need to make more of the CWA aware of your gem. I am curious about our times from Sundays races. Are the results going to be posted anywhere, and if so will they be full results including raw times and scores? This topic was modified 1 year ago by Dave McGovern. We are working on the results and will have them ready in (hopefully) a couple of days. If you are wondering how we can award medals and still be “working on the results” – after each day’s racing we do have complete results which are used to award medals. Back home after the race, we do a check of all the judging sheets vs what is entered in the computer. We usually find a few errors either in communication from judges, entry onto worksheets in the scoring tent or entry errors in the computer. On rare occasions, we find errors that affect 1st/2nd/3rd but usually they don’t have any major impact on standings. We also try to “pretty up” the results to make for better reading. The results will show raw time plus total penalties, 1st/2nd runs. If you are interested in individual gate penalties, we can send you a file with that data. Glad you enjoyed the race despite the low water and cold temps. PS: Jim was first in K1M Long Plastic. I will mail his medal soon. This reply was modified 1 year ago by ChrisMatsuno. Hi folks, last year we had such a good time that I promised to bring more Chicago boaters along. I’m doing my best. I think we have about a dozen to eighteen coming to invade the Saint this year. Not everyone will race, quite a few have never seen your river and they jumped at the chance to road trip. Jim T, Rich and myself are all returning to see the run with what, 3 more inches of water? Don’t be shy about stopping by sites 33, 39, or 45 and saying hi, or enjoying a beverage by the fire. If you run into Randy, ask him about getting beat up by robots in a factory. It’s good for a story and a laugh. See you at the Downriver race! Wish I would have got a chance to talk to you guys. Julie A. and I raced at your festival last year and had a great time. 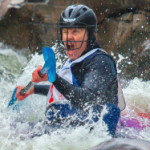 Hope to come up again this year for some more urban whitewater racing, maybe more MWA folks will make the trip. The full results with times, penalties and scores for both runs in each event will be posted under “Competition”. Thanks to all that helped out with the races this year, it was a Blast! I could not agree with Dave’s comments more. You all put on a great race in every way: organization, volunteers, course design, even the weather! The best part, by far, is the warmth and camaraderie. You are fantastic hosts. You even had carts to schlep boats back the start! All your hard work is appreciated. It made the trip from the Chicago area worth every mile!